Choose: Size King Queen Twin Full Cal King Twin XL Choose: Mattress Height 9" 13"
The Protect-A-Bed® Ultimate Bug Protection Kit protects the mattress using AllerZip® bed bug protection kit. The kit provide complete mattress protection for a healthy and bed bug free sleep zone. It features BugLock® three-sided zipper and AllerZip® seal gives total protection against dust mites, allergens and bed bugs. The Ultimate Bed Bug Protection Kit Twin Size has many exciting features for users of all types. See the Ultimate Bed Bug Protection Kit Twin Size product video and gallery images above for more details. 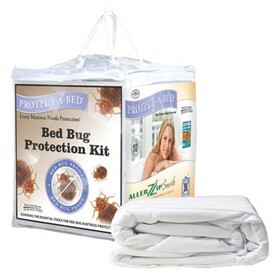 The Ultimate Bed Bug Protection Kit Twin Size is sold as a Brand New Unopened Item.